The evolution of the eukaryotic cell marked a profound moment in Earth’s history, with most of the visible biota coming to rely on intracellular membrane-bound organelles. It has been suggested that this evolutionary transition was critically dependent on the movement of ATP synthesis from the cell surface to mitochondrial membranes and the resultant boost to the energetic capacity of eukaryotic cells. However, contrary to this hypothesis, numerous lines of evidence suggest that eukaryotes are no more bioenergetically efficient than prokaryotes. Thus, although the origin of the mitochondrion was a key event in evolutionary history, there is no reason to think membrane bioenergetics played a direct, causal role in the transition from prokaryotes to eukaryotes and the subsequent explosive diversification of cellular and organismal complexity. Over time, life on Earth has evolved into three large groups: archaea, bacteria, and eukaryotes. The most familiar forms of life – such as fungi, plants and animals – all belong to the eukaryotes. Bacteria and archaea are simpler, single-celled organisms and are collectively referred to as prokaryotes. The hallmark feature that distinguishes eukaryotes from prokaryotes is that eukaryotic cells contain compartments called organelles that are surrounded by membranes. Each organelle supports different activities in the cell. Mitochondria, for example, are organelles that provide eukaryotes with most of their energy by producing energy-rich molecules called ATP. Prokaryotes lack mitochondria and instead produce their ATP on their cell surface membrane. Some researchers have suggested that mitochondria might actually be one of the reasons that eukaryotic cells are typically larger than prokaryotes and more varied in their shape and structure. The thinking is that producing ATP on dedicated membranes inside the cell, rather than on the cell surface, boosted the amount of energy available to eukaryotic cells and allowed them to diversify more. However, other researchers are not convinced by this view. Moreover, some recent evidence suggested that eukaryotes are no more efficient in producing energy than prokaryotes. Lynch and Marinov have now used computational and comparative analysis to compare the energy efficiency of different organisms including prokaryotes and eukaryotes grown under defined conditions. To do the comparison, the results were scaled based on cell volume and the total surface area deployed in energy production. From their findings, Lynch and Marinov concluded that mitochondria did not enhance how much energy eukaryotes could produce per unit of cell volume in any substantial way. Although the origin of mitochondria was certainly a key event in evolutionary history, it is unlikely to have been responsible for the diversity and complexity of today’s life forms. The hallmark feature distinguishing eukaryotes from prokaryotes (bacteria and archaea) is the universal presence in the former of discrete cellular organelles enveloped within lipid bilayers (e.g. the nucleus, mitochondria, endoplasmic reticulum, golgi, vacuoles, vesicles, etc.). Under a eukaryocentric view of life, these types of cellular features promoted the secondary origin of genomic modifications that ultimately led to the adaptive emergence of fundamentally superior life forms (Martin and Koonin, 2006; Lane and Martin, 2010). Most notably, it has been proposed that the establishment of the mitochondrion provided an energetic boost that fueled an evolutionary revolution responsible for all things eukaryotic, including novel protein folds, membrane-bound organelles, sexual reproduction, multicellularity, and complex behavior (Lane, 2002, 2015). However, despite having more than two billion years to impose their presumed superiority, eukaryotes have not driven prokaryotes extinct. Prokaryotes dominate eukaryotes both on a numerical and biomass basis (Whitman et al., 1998; Lynch, 2007), and harbor most of the biosphere’s metabolic diversity. Although there is no logical basis for proclaiming the evolutionary inferiority of prokaryotes, one central issue can be addressed objectively – the degree to which the establishment of eukaryotic-specific morphology altered energetic efficiency at the cellular level. Drawing on observations from biochemistry, physiology, and cell biology, we present a quantitative summary of the relative bioenergetic costs and benefits of the modified architecture of the eukaryotic cell. 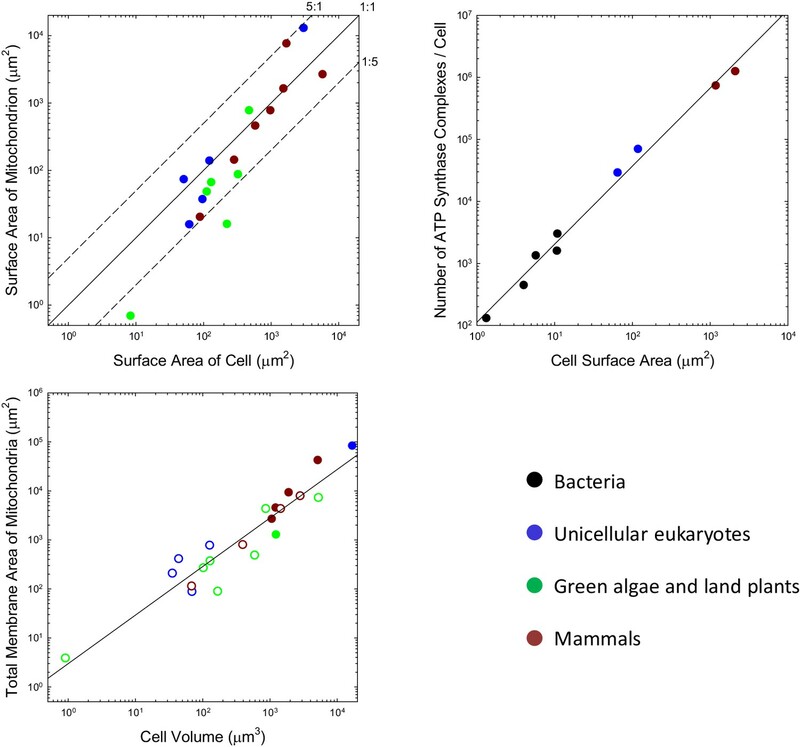 The data indicate that once cell-size scaling is taken into account, the bioenergetic features of eukaryotic cells are consistent with those in bacteria. This implies that the mitochondrion-host cell consortium that became the primordial eukaryote did not precipitate a bioenergetics revolution. The starting point is a recap of recent findings on the scaling properties of the lifetime energetic expenditures of single cells. All energy utilized by cells can be partitioned into two basic categories: that employed in cell maintenance and that directly invested in building the physical infrastructure that comprises a daughter cell. Maintenance costs involve a diversity of cellular functions, ranging from turnover of biomolecules, intracellular transport, control of osmotic balance and membrane potential, nutrient uptake, information processing, and motility. Cell growth represents a one-time investment in the production of the minimum set of parts required for a progeny cell, whereas cell maintenance costs scale with cell-division time. The common usage of metabolic rate as a measure of power production is uninformative from an evolutionary perspective, as it fails to distinguish the investment in cellular reproduction from that associated with non-growth-related processes. To make progress in this area, a common currency of energy is required. The number of ATP→ADP turnovers meets this need, as such transformations are universally deployed in most cellular processes of all organisms, and where other cofactors are involved, these can usually be converted into ATP equivalents (Atkinson, 1970). When cells are grown on a defined medium for which the conversion rate from carbon source to ATP is known (from principles of biochemistry), the two categories of energy allocation can be quantified from the regression of rates of resource consumption per cell on rates of cell division (Bauchop and Elsden, 1960; Pirt, 1982; Tempest and Neijssel, 1984). where t is the cell-division time in hours. Derived from cells ranging over four orders of magnitude in volume, neither of the preceding scaling relationships is significantly different from expectations under isometry (with exponent 1.0), as the standard errors of the exponents in Equations (1a,b) are 0.07 and 0.04, respectively. Moreover, as there is no discontinuity in scaling between prokaryotes and eukaryotes, these results suggest that a shift of bioenergetics from the cell membrane in prokaryotes to the mitochondria of eukaryotes conferred no directly favorable energetic effects. In fact, the effect appears to be negative. Taking into account the interspecific relationships between cell-division time and cell volume (Lynch and Marinov, 2015) and using Equation (1b), one can compute the scaling of the rate of incorporation of energy into biomass, CG/t. For bacteria, cell-division times decline with increasing cell volume as ∼V-0.17, albeit weakly (the SE of the exponent being 0.11), implying that the rate of biomass accumulation scales as ∼V0.97+0.17=V1.14 on a per-cell basis and as ∼V1.14-1.00=V0.14 on a cell volumetric basis (with the SEs of both exponents being 0.12). In contrast, in most eukaryotic groups, cell-division times increase with cell volume, on average scaling as ∼V0.13, implying a scaling of ∼V0.84 for the rate of biomass accumulation per cell and ∼V-0.16 on a volumetric basis (with SEs equal to 0.06 for the exponents). Thus, in terms of biomass production, the bioenergetic efficiency of eukaryotic cells declines with cell volume, whereas that of bacterial cells does not. The pattern observed in bacteria is inconsistent with the view that surface area limits the rate of energy production, as this leads to an expected scaling of ∼V2/3 on a per-cell basis. The argument that mitochondria endow eukaryotic cells with exceptionally high energy provisioning derives from the idea that large internal populations of small mitochondria with high surface area-to-volume ratios provide a dramatic increase in bioenergetic-membrane capacity (Lane and Martin, 2010). In prokaryotes, the F0F1 ATP synthase (the molecular machine that transforms ADP to ATP in the process of chemiosmosis) and the electron transport chain (ETC) components (which create the chemiosmotic proton gradient) are restricted to the cell membrane, but in eukaryotes, they are confined to inner mitochondrial membranes. A key question is whether the bioenergetic capacity of cells is, in fact, limited by membrane surface area. Although the situation at the time of first colonization of the mitochondrion is unknown, the iconic view of mitochondria being tiny, bean-shaped cellular inclusions is not entirely generalizable. For example, many unicellular eukaryotes harbor just a single mitochondrion or one that developmentally moves among alternative reticulate states (e.g. Rosen et al., 1974; Osafune et al., 1975; Biswas et al., 2003; Yamaguchi et al., 2011). Such geometries necessarily have lower total surface areas than a collection of spheroids with similar total volumes. For the range of species that have been examined, many of which do have small individualized mitochondria, the total outer surface area of mitochondria per cell is generally on the order of the total area of the plasma membrane, with no observed ratio exceeding 5:1, and many being considerably smaller than 1:1 (Figure 1a). It may be argued that the outer surface area of the mitochondrion is of less relevance than that of the inner membrane (where the ATP synthase complex sits), but the ratios of inner (including the internal cristae) to outer membrane areas for mitochondria in mammals, the green alga Ochromonas, the plant Rhus toxicodendron, and the ciliate Tetrahymena are 5.0 (SE = 1.1), 2.4, 2.5, and 5.2, respectively (Supplementary material). Thus, the data are inconsistent with the idea that the mitochondrion engendered a massive expansion in the surface area of bioenergetic membranes in eukaryotes. Scaling features of membrane properties with cell size. (a) Relationship between the total outer surface area of mitochondria and that of the plasma membrane for all species with available data. Diagonal lines denote three idealized ratios of the two. (b) The number of ATP synthase complexes per cell scales with cell surface area (S, in μm2) as 113⁢S1.26 (r2=0.99). (c) Relationship between the total (inner + outer) surface area of mitochondria and cell volume for all species with available data. Open points are extrapolations for species with only outer membrane measures, derived by assuming an inner:outer ratio of 4.6, the average of observations in other species. References to individual data points are provided in Appendix 1–tables 1 and 2. Three additional observations raise questions as to whether membrane surface area is a limiting factor in ATP synthesis. First, the localization of mitochondrial ATP synthase complexes is restricted to two rows on the narrow edges of the inner cristae (Kühlbrandt, 2015). Because this confined region comprises <<10% of the total internal membrane area, the surface area of mitochondrial membranes allocated to ATP synthase appears to be less than the surface area of the cell itself. Second, only a fraction of bacterial membranes appears to be allocated to bioenergetic functions (Magalon and Alberge, 2016), again shedding doubt on whether membrane area is a limiting factor for energy production. Third, in every bacterial species for which data are available, growth in cell volume is close to exponential, that is, the growth rate of a cell increases as its cell volume increases despite the reduction in the surface area:volume ratio (Voorn and Koppes, 1998; Godin et al., 2010; Santi et al., 2013; Iyer-Biswas et al., 2014; Osella et al., 2014; Campos et al., 2014). Further insight into this issue can be achieved by considering the average packing density of ATP synthase for the few species with proteomic data sufficient for single-cell counts of individual proteins. By accounting for the stoichiometry of the various subunits in the complex, it is possible to obtain several independent estimates of the total number of complexes per cell under the assumption that all the proteins are assembled (Supplementary material). For example, the estimated number of complexes in E. coli is 3018, and the surface area of the cell is ~15.8 μm2. Based on the largest diameter of the molecule (the F1 subcomplex), a single ATP synthase in this species occupies ~64 nm2 (Lücken et al., 1990) of surface area, so the total set of complexes occupies ~1.8% of the cell membrane. Four other diverse bacterial species for which these analyses can be performed yield occupancies ranging from 0.6% to 1.5%, for an overall average of 1.1% for bacteria. This will be an overestimate if only a fraction of proteins are properly assembled and embedded in the cell membrane. This kind of analysis can be extended to eukaryotes, noting that eukaryotic ATP synthases are slightly larger, with maximum surface area of ~110 nm2 (Abrahams et al., 1994; Stock et al., 1999). Although ATP synthase resides in mitochondria in eukaryotes, it is relevant to evaluate the fractional area that would be occupied were they to be located in the cell membrane. Such hypothetical packing densities are 5.0% and 6.6%, respectively, for the yeasts S. cerevisiae and S. pombe, and 6.6% and 6.8% for mouse fibroblasts and human HeLa cells. Although these observations suggest a ~5 fold increase in ATP synthase abundance with cell surface area in eukaryotes, the data conform to a continuous allometric function with no dichotomous break between the bacteria and eukaryotes (Figure 1b). Similar conclusions can be reached regarding the ETCs, although direct comparisons are more difficult due to the diversity of electron transport chain complexes in prokaryotes (Price and Driessen, 2010). The number of ETC complexes is comparable to that of ATP synthases in both bacteria and eukaryotes (Supplementary Material), and the physical footprint of the ETC is ~5× that of F0F1 (~570 nm2; Dudkina et al., 2011), implying that an average of ~5.5% of bacterial cell membranes is dedicated to the ETC and that the corresponding hypothetical packing density for eukaryotes would be ~30% (if in the cell membrane). There are a number of uncertainties in these packing-density estimates, and more direct estimates are desirable. The optimum and maximum-possible packing densities for ATP synthase also remain unclear. Nonetheless, the fact remains that any packing problems that exist for the cell membrane are also relevant to mitochondrial membranes, which have additional protein components (such as those involved in internal-membrane folding and transport into and out of the mitochondrion). Any attempt to determine the implications of membranes for cellular evolution must account for the high biosynthetic costs of lipid molecules. There are two ways to quantify such a cost. First, from an evolutionary perspective, the cost of synthesizing a molecule is taken to be the sum of the direct use of ATP in the biosynthetic pathway plus the indirect loss of ATP resulting from the use of metabolic precursors that would otherwise be converted to ATP and available for alternative cellular functions (Akashi and Gojobori, 2002; Lynch and Marinov, 2015). Second, to simply quantify the direct contribution to a cell’s total ATP requirement, the costs of diverting metabolic precursors are ignored. By summing the total costs of all molecules underlying a cellular feature and scaling by the lifetime energy expenditure of the cell, one obtains a measure of the relative drain on the cell’s energy budget associated with building and maintaining the trait. This measurement, sc, can then be viewed as the fractional increase in the cell’s energy budget that could be allocated to growth, reproduction, and survival in the absence of such an investment, ignoring the direct fitness benefits of expressing the trait, sa. For selection to be effective, the net selective advantage of the trait, sn=sa-sc, must exceed the power of random genetic drift, 1/Ne in a haploid species and 1/(2⁢Ne) in a diploid, where Ne is the effective population size. in bacteria and eukaryotes, respectively. From the standpoint of a cell’s total energy budget, the evolutionary cost of a lipid molecule is cL/CT. For most lipids in biological membranes, 14≤NL≤22 and 0≤NU≤6, so the cost per lipid molecule is generally in the range of cL≃200 to 600 ATP, although the average over all lipids deployed in species-specific membranes is much narrower (below). Cardiolipin, which rarely constitutes more than 20% of membrane lipids is exceptional, having an evolutionary cost of ~640 ATP/molecule (and a reduced cost of ~240 ATP). To put these expenditures into perspective, the evolutionary biosynthetic costs of each of the four nucleotides is ≈ 50 ATP hydrolyses per molecule (Lynch and Marinov, 2015), whereas the average cost of an amino acid is ≈30 ATP (Atkinson, 1970; Akashi and Gojobori, 2002). Application of the preceding expressions to the known membrane compositions of cells indicates that the biosynthetic costs of eukaryotic lipids are higher than those in bacteria (Supplementary table). For example, for a diversity of bacterial species the average direct cost per lipid molecule in the plasma membrane is 123 (SE = 3) ATP, whereas that for eukaryotes is 143 (2). The latter estimate is identical to the mean obtained for whole eukaryotic cells, but the cost of mitochondrial lipids is especially high, 155 (5). These elevated expenses in eukaryotes are joint effects of the cost of mitochondrial export of oxaloacetate to generate acetyl-CoA and the tendency for eukaryotic lipids to have longer chains containing more desaturated carbons. where A is the membrane surface area in units of μm2, and c¯L is the average cost of a lipid. or ∼15% of the total growth budget of a minimum-sized (1 μm3) eukaryotic cell, and nearly independent of cell size within the range typically found in eukaryotes (SE of the exponent is 0.08). The direct contribution of mitochondrial membrane lipids to a cell’s growth budget is ~36% of this total cost. These costs of mitochondrial membranes represent a baseline price, not incurred by prokaryotes, associated with relocating bioenergetics to the interior of eukaryotic cells, that is, ~5%. Unfortunately, the additional costs of maintenance of mitochondrial lipids is unknown, but for rapidly growing cells, the vast majority of a cell’s energy budget is allocated to growth (Lynch and Marinov, 2015), so the above costs should still apply as first-order approximations; for slowly growing cells, the costs will be higher or lower depending on whether the cost of mitochondrial-membrane maintenance is above or below that for total cellular maintenance. Proteins do not occupy >50% of membranes, so accounting for this would change the preceding results by a factor <2. For prokaryotic cells without internal membranes, the relative contribution of the cell membrane to a cell’s total energy budget is expected to decline with increasing cell size, owing to the decline in the surface area to volume ratio. For the tiny cells of Leptospira interrogans and Mycoplasma pneumoniae (average volumes of 0.03 and 0.22 μm3, respectively), ~63 and 43% of a cell’s growth budget must be allocated to the plasma membrane, but for the larger Bacillus subtilis and Escherichia coli (on average, 1.4 and 1.0 μm3, respectively), these contributions drop to ~14 and 19%, and they would be expected to continue to decline with further increases in cell size, scaling inversely with the linear dimension of the cell. In contrast, owing to the increased investment in internal membranes, the fraction of a eukaryotic cell’s energy budget devoted to membranes does not diminish with increasing cell size. Although there are only a few eukaryotic cell types for which this issue can be evaluated quantitatively (Table 1), the data span three orders of magnitude in cell volume and uniformly suggest that ~10 to 30% of the total growth budget is allocated to lipid biosynthesis, and that an increasing fraction of such costs is associated with internal membranes in cells of increasing size. The picoplanktonic alga Ostreococcus, which has a cell volume of just 0.22 μm3 (below that of many prokaryotes), devotes ~32% of its energy budget to membranes, and 44% of these costs (~18% of the total cell budget) are associated with internal membranes. A moderate-sized mammalian cell devotes a similar ~30% of its energy budget to membranes, but 96% of these costs (~29% of the total cell budget) are associated with internal membranes. Contributions of membranes to total cellular growth costs. Ot denotes the green alga Ostreococcus tauri, Sc the yeast Saccharomyces cerevisiae, Ds the green alga Dunaliella salina, and Ss the pig (Sus scrofa) pancreas cell; references given in Supplementary material. Cell volumes and total membrane areas are in units of μm3 and μm2, respectively, with the latter excluding membranes associated with the plastids in the algal species. The fraction of the total cell growth budget allocated to membranes is obtained by the ratio of Equations (1b) and (4), using the species-specific reduced costs in Table 1 where available, and otherwise applying the averages for eukaryotic species; this total cost is then apportioned into five different fractional contributions in the following lines. Taken together, these observations imply that the use of internal membranes constitutes a major drain on the total energy budgets of eukaryotic cells, much more than would be expected in bacteria of comparable size. Moreover, because the lipids associated with mitochondria alone constitute 20% to 35% of a eukaryotic cell’s investment in membranes (Table 1), the energetic burden of localizing membrane bioenergetics to mitochondria is substantial. Finally, given that the observations summarized in Figure 1a,b are derived from a diversity of studies, likely with many unique inaccuracies, it is worth considering whether the overall conclusions are consistent with the known capacity of ATP synthase. First, it bears noting that only a fraction of the energy invested in biosynthesis is derived directly from the chemiosmotic activity of ATP synthase. For example, amino-acid biosynthesis involves ~1.5 oxidations of NADH and NADPH for every ATP hydrolysis (Akashi and Gojobori, 2002). Assuming that each of the former is equivalent to ~3 ATP hydrolyses, this implies that only ~18% of the energy invested in amino-acid biosynthesis involves ATP hydrolysis. As noted in the Supplementary text, the ratio of use of NADH/NADPH to ATP is more on the order of 2.0 in lipid biosynthesis, reducing the direct investment in ATP to ~14% Thus, as the vast majority of the energetic cost of building a cell is associated with synthesis of the monomeric building blocks of proteins and membranes, only ~15% of biosynthetic energy may be derived from ATP hydrolysis. Given the known energy requirements for the maintenance and growth of a cell, the cell-division time, and the number of ATP synthase complexes per cell, it is possible to estimate the required rate of ADP → ATP conversions per complex. Using the cellular energetic data previously presented (Lynch and Marinov, 2015) and the ATP synthase abundances in Appendix 1–table 2, after discounting the maximum values by 85%, the estimated required rates of ATP production/complex/sec are: 2109, 221, and 19 respectively for the bacteria B. subtilis, E. coli, and M. pneumoniae, and 1440 and 329 for the yeasts S. cerevisiae and S. pombe. Several attempts have been made to estimate the maximum turnover rates (per sec) for F0F1 ATP synthase, usually in reconstituted liposomes, and these average 195/s in bacteria (Etzold et al., 1997; Slooten and Vandenbranden, 1989; Toei et al., 2007), 295 in soybean plastids (Schmidt and Gräbe, 1985; Junesch and Gräber, 1991), 120 in S. cerevisiae (Förster et al., 2010), and 440 in bovine heart (Matsuno-Yagi and Hatefi, 1988). Thus, given that a substantial fraction of complexes are likely to be misassembled in artificial membranes, the energy-budget based estimates of the numbers of ATP turnovers generated per cell appear to be consistent with the known capacity of ATP synthase. The ribosome content of a cell provides a strong indicator of its bioenergetic capacity. Owing to the large number of proteins required to build the complex, ribosomes are energetically costly, and the number per cell appears to be universally correlated with cellular growth rate (Fraenkel and Neidhardt, 1961; Tempest et al., 1965; Brown and Rose, 1969; Poyton, 1973; Dennis and Bremer, 1974; Freyssinet and Schiff, 1974; Alberghina et al., 1975; Boehlke and Friesen, 1975; Waldron and Lacroute, 1975; Scott et al., 2010). 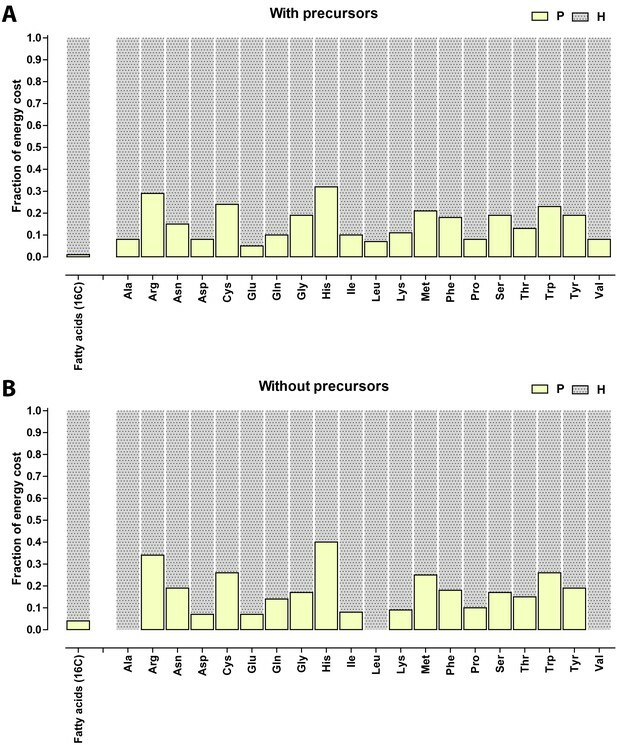 We previously pointed out that the genome-wide total and mean number of transcripts per gene scale with cell volume as V0.36 and V0.28 respectively, and that the analogous scalings are V0.93 and V0.66 for proteins, with no dichotomous break between prokaryotes and eukaryotes (Lynch and Marinov, 2015). 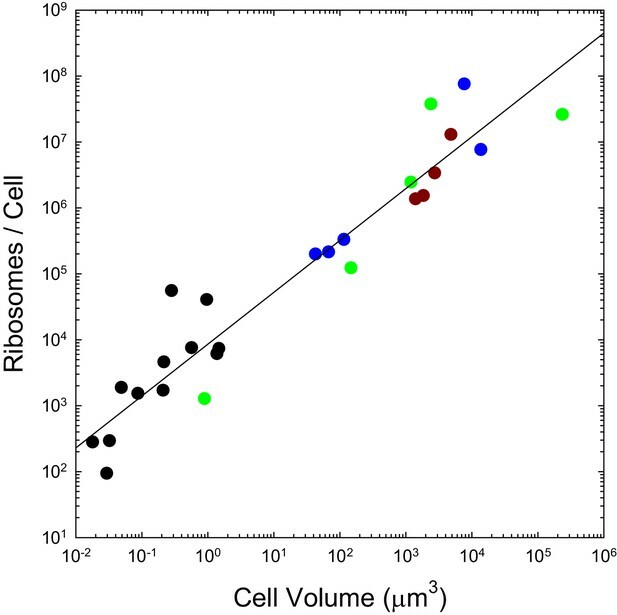 As with the transcripts they process and the proteins they produce, the numbers of ribosomes per cell also appear to scale sublinearly with cell volume, in a continuous fashion across bacteria, unicellular eukaryotes, and cells derived from multicellular species (Figure 2). These observations are inconsistent with the idea that entry into the eukaryotic world resulted in an elevated rate of protein production. Moreover, as noted previously (Lynch and Marinov, 2015), the absolute costs of producing individual proteins and maintaining the genes associated with them are substantially higher in eukaryotes than in bacteria, owing to the substantial increase in gene lengths, investment in nucleosomes, etc. The number of ribosomes per cell scales with cell volume (V, in μm3) as 8551⁢V0.79 (r2=0.91; SEs of the intercept and slope on the log scale are 0.14 and 0.06, respectively). Color coding as in previous figures. References to individual data points are provided in Appendix 1–table 3. Lane (2015) and Lane and Martin (2010) have proposed a scenario for how the mitochondrion became established by a series of adaptive steps, arguing that the eukaryotic leap to increased gene number and cellular complexity, and a subsequent adaptive cascade of morphological diversification, ‘was strictly dependent on mitochondrial power'. However, the scaling of the costs of building and maintaining cells is inconsistent with an abrupt shift in volumetric bioenergetic capacity of eukaryotic cells, and although the absolute costs of biosynthesis, maintenance, and operation of individual genes are much greater in eukaryotes, the proportional costs are less (Lynch and Marinov, 2015). This means that evolutionary additions and modifications of genes are more easily accrued in eukaryotic genomes from a bioenergetics perspective, regardless of their downstream fitness effects. The analyses presented here reveal a number of additional scaling features involving cellular bioenergetic capacity that appear to transcend the substantial morphological differences across the bacterial-eukaryotic divide. There is not a quantum leap in the surface area of bioenergetic membranes exploited in eukaryotes relative to what would be possible on the cell surface alone, nor is the idea that ATP synthesis is limited by total membrane surface area supported. Moreover, the numbers of both ribosomes and ATP synthase complexes per cell, which jointly serve as indicators of a cell’s capacity to convert energy into biomass, scale with cell size in a continuous fashion both within and between bacterial and eukaryotic groups. Although there is considerable room for further comparative analyses in this area, when one additionally considers the substantial cost of building mitochondria, it is difficult to accept the idea that the establishment of the mitochondrion led to a major advance in net bioenergetic capacity. Most discussion of the origin of the mitochondrion by endosymbiosis starts (and often ends) with a consideration of the benefits gained by the host cell. This ignores the fact that the eukaryotic consortium consists of two participants. At least initially, the establishment of a stable symbiotic relationship requires that each member of the pair gain as much from the association as is lost by relinquishing independence. Under the scenario painted by Lane and Martin (2010), and earlier by Martin and Müller (1998), the original mitochondrial-host cell affiliation was one in which the intracellular occupant provided hydrogen by-product to fuel methanogenesis in the host cell, while eventually giving up access to external resources and thereby coming to rely entirely on the host cell for organic substrates. For such a consortium to be evolutionarily stable as a true mutualism, both partners would have to acquire more resources than would be possible by living alone, in which case this novel relationship would be more than the sum of its parts. Although some scenario like this might have existed in the earliest stages of mitochondrial establishment, it is also possible that one member of the original consortium was a parasite rather than a benevolent partner (made plausible by the fact that many of the α-protobacteria to which mitochondria are most closely related are intracellular parasites). Despite its disadvantages, such a system could be rendered stable if one member of the pair (the primordial mitochondrion) experienced relocation of just a single self-essential gene to the other member’s genome, while the other lost a key function that was complemented by the presence of the endosymbiont. This scenario certainly applies today, as all mitochondria have relinquished virtually all genes for biosynthesis, replication, and maintenance, and as a consequence depend entirely on their host cells for these essential metabolic functions. In contrast, all eukaryotes have relocated membrane bioenergetics from the cell surface to mitochondrial membranes. Such an outcome represents a possible grand example of the preservation of two ancestral components by complementary degenerative mutations (Force et al., 1999). Notably, this process of subfunctionalization is most likely to proceed in relatively small populations because the end state is slightly deleterious from the standpoint of mutational vulnerability, owing to the fact that the original set of tasks becomes reliant on a larger set of genes (Lynch et al., 2001). Thus, a plausible scenario is that the full eukaryotic cell plan emerged at least in part by initially nonadaptive processes made possible by a very strong and prolonged population bottleneck (Lynch, 2007; Koonin, 2015). The origin of the mitochondrion was a singular event, and we may never know with certainty the early mechanisms involved in its establishment, nor the order of prior or subsequent events in the establishment of other eukaryotic cellular features (Koonin, 2015). However, the preceding observations suggest that if there was an energetic boost associated with the earliest stages of mitochondrial colonization, this has subsequently been offset by the loss of the use of the eukaryotic cell surface for bioenergetics and the resultant increase in costs associated with the construction of internal membranes. Rather than a major bioenergetic revolution being provoked by the origin of the mitochondrion, at best a zero-sum game is implied. Thus, if the establishment of the mitochondrion was a key innovation in the adaptive radiation of eukaryotes, the causal connection does not appear to involve a boost in energy acquisition. Notably, a recent analysis suggests that the origin of the mitochondrion postdated the establishment of many aspects of eukaryotic cellular complexity (Pittis and Gabaldón, 2016). It is plausible, that phagocytosis was a late-comer in this series of events, made possible only after the movement of membrane bioenergetics to the mitochondrion, which would have eliminated the presumably disruptive effects of ingesting surface membranes containing the ETC and ATP synthase. The results in this paper are derived from an integration of bioenergetic analyses based on known biochemical pathways and existing morphological observations on a variety of cell-biological features. The sources of this information, as well as the basic approaches employed can be found in the Appendix (where not mentioned directly in the text). The central analyses involve: (1) estimation of the biosynthetic costs for lipid-molecule production (in terms of ATP equivalents per molecule produced); (2) mitochondrial surface areas and cell membrane areas; (3) investments in lipids at the cell-membrane and organelle levels; and (4) numbers of ATP synthase complexes, ETC complexes, and ribosomes per cell. The vast majority of lipids in most membranes are phospholipids, with a polar (hydrophilic) head group attached to a negatively charged phosphate, which in turn is attached to a glycerol-3-phosphate (G3P), which links to two fatty-acid chains. Diversity within this lipid family is associated with variation in: the nature of the head groups; the number of carbon atoms in the fatty-acid chains; and the number of double bonds connecting such carbon atoms (their presence leading to ‘unsaturated’ fatty acids). Common head groups are choline, ethanolamine, serine, glycerol, inositol, and phosphatidyl glycerol. In both bacteria and eukaryotes, fatty-acid chains usually contain 12 to 22 carbons, and only rarely harbor more than three unsaturated bonds. The starting point for the synthesis of most fatty acids is the production of one particular linear chain, palmitate, which contains 16 carbon atoms. Synthesis of this molecule takes place within a large complex, known as fatty-acid synthase. In bacteria, biosynthesis of each palmitate molecule requires the consumption of 8 acetyl-CoA molecules, 7 ATPs, and reductions of 14 NADPHs. Each molecule of acetyl-CoA is generally derived from a pyruvate molecule, but each acetyl-CoA molecule diverted to lipid production deprives the cell of one rotation of the energy producing citric-acid cycle, which would otherwise yield 3 NADH, 1 FADH2, and 1 ATP per rotation; this leads to a net loss to the cell of the equivalent of 12 ATPs per acetyl-CoA molecule. Thus, the total cost of production of one molecule of palmitate in bacteria is (8×12)+(7×1)+(14×3)=145 ATP.Fatty-acid production is slightly more expensive in nonphotosynthetic eukaryotes, where acetyl-CoA is produced in the mitochondrion and reacts with oxaloacetate to produce citrate, which must then be exported. Cleavage of oxaloacetate in the cytosol regenerates acetyl-CoA at the expense of 1 ATP, and a series of reactions serve to return oxaloacetate to the citric-acid cycle in an effectively ATP neutral way. Thus, the cost of palmitate increases to 145+8=153 ATP. Each additional pair of carbons added to the palmitate chain requires one additional acetyl-CoA, one additional ATP, and two additional NADPHs, or an equivalent of 19 ATPs in bacteria, and accounting for mitochondrial export increases this to 20 in eukaryotes. Each subsequent desaturation of a fatty-acid bond consumes one NADPH, or 3 ATP equivalents. The G3P linker emerges from one of the last steps in glycolysis, and its diversion to lipid production deprives the cell of one further step of ATP production as well as a subsequent pyruvate molecule. As pyruvate normally can yield the equivalent of 3 ATPs in the conversion to acetyl-CoA, which then would generate a net 12 ATPs following entry into the citric-acid cycle, the use of G3P as a linker in a lipid molecule has a cost of 1+3+12=16 ATP. Linking each fatty-acid tail requires 1 ATP, and linking the head group involves two CTP hydrolyses. All that remains now is to add in the cost of synthesis of the head group, which we do here still assuming 16 saturated bonds in each fatty acid. In the case of phosphatidylglycerol, the head group is G3P, the cost of which is 16 ATP as just noted, so the total cost of this molecule in a bacterium is ≃(2⋅145)+(16+4)+16=326 ATP. From Akashi and Gojobori (2002), the cost of a serine is 10 ATP, so the total cost of a phosphatidylserine is 320 ATP, and because ethanolamine and choline are simple derivatives of serine, this closely approximates the costs of both phosphatidylethanolamine and phosphatidylcholine. The headgroup of phosphatidylinositol is inosital, which is derived from glucose-6-phosphate, diverting the latter from glycolysis and depriving the cell of the equivalent of 9 ATPs, so the total cost of production of this molecule is 319 ATP. As a first-order approximation, we will assume all of the above molecules to have a cost of 321 ATP when containing fully saturated fatty acids with chain length 16. Finally, cardiolipin is synthesized by the fusion of two phosphatidylglycerols and the release of one glycerol, so taking the return from the latter to be 15 ATP, the total cost per molecule produced is 637 ATP. Information on absolute protein copy numbers per cell was collected from publicly available proteomics measurements (Lu et al., 2007; Wiśniewski et al., 2012, 2014; Maass et al., 2011; Maier et al., 2011; Schmidt et al., 2011; Beck et al., 2009; Kulak et al., 2014; Ghaemmaghami et al., 2003; Marguerat et al., 2012; Schwanhäusser et al., 2011) as well as from ribosome profiling data (as described in Lynch and Marinov, 2015). where Np are the estimated per cell copy numbers for each subunit p with a stoichiometric ratio sp. Clear outliers (i.e., subunits with zero or near-zero counts) were removed from the calculation. where NR,r⁢a⁢w refers to the estimated ribosome copy numbers derived as above, while NR,d⁢i⁢r⁢e⁢c⁢t is obtained from direct measurements of ribosome copies per cell. The same composition and stoichiometry was also assumed for other prokaryotes. Relative contribution of ATP (P) and NADH/NADPH/FADH2 (H) to the biosynthetic costs of lipids and amino acids. (A) Nonreduced costs including opportunity cost of precursors; (B) Reduced costs without precursors. Amino acid values are obtained from Akashi and Gojobori (2002), assuming growth on glucose. Estimated abundance of ATP synthase complexes in species with quantitative proteomics data. ATP synthase surface area assumed to be maximum associated with the inner ring, 6.4 × 10−5 m2 for bacteria, 1.1 × 10−4 for eukaryotes. V: cell volume (in μm3); S⁢AC: cellular surface area (in μm2); NP⁢C,r⁢a⁢w: raw protein complex copy number estimates; NP⁢C,c⁢o⁢r⁢r: corrected protein complex copy number estimates; cR: correction factor; P⁢D: packing density (copies/μm2); fSA: fraction of SA: cell division time (hours); CG, CM, CT: costs of building a cell per in 109 ATP equivalents; CG: growth; CM: maintenance (per hours); CT: total; Rm⁢a⁢x and Rr⁢e⁢d: maximum (all ATP equivalents) and reduced (without ATP equivalents expended in the form of NADH/NADPH/FADH2) required rate of ATP synthesis (per complex per second) to satisfy lifetime energy requirements. Costs of lipids. The average cost per molecule is calculated for a variety of species using estimates of lipid compositions from the literature and the formulas described in the text. The fraction of fatty acids of given length and saturation level is not shown. Cardiolipin costs are assumed to be 637 (evolutionary) and 236 (reduced) ATP. The cost for molecules in the ‘other’ category is assumed to be the average of glycerophospholipids (GPL) in the species and cardiolipin. Cell and Tissue Research 200:495–509. The Journal of Biological Chemistry 250:4381–4388. Biochimica et Biophysica Acta (BBA) - Molecular and Cell Biology of Lipids 1841:1003–1011. Advances in Enzyme Regulation 9:207–219. European Journal of Biochemistry 2:448–453. Journal of Electron Microscopy 52:133–143. The Journal of Cell Biology 61:269–287. The Journal of General Physiology 53:43–56. The Journal of General Physiology 53:57–69. Journal of Cell Science 8:153–183. 1559, Modulation of chemical composition and other parameters of the cell by growth rate, Escherichia Coli and Salmonella Typhimurium: Cellular and Molecular Biology, Vol. 97, 2nd edn. Journal of Ultrastructure Research 76:1–14. Journal of Ultrastructure Research 76:15–26. The Journal of Biological Chemistry 258:6887–6898. The Journal of Experimental Biology 203:29–33. Journal of General Microbiology 83:369–373. Biochimica et Biophysica Acta (BBA) - Biomembranes 249:462–492. Biochimica et Biophysica Acta (BBA) - Biomembranes 419:271–284. The Journal of Biological Chemistry 238:3199–3209. The Journal of Biological Chemistry 258:7228–7235. Biochimica et Biophysica Acta (BBA) - Lipids and Lipid Metabolism 337:60–67. European Journal of Biochemistry 243:336–343. Applied and Environmental Microbiology 64:4433–4438. Journal of Cell Science 21:329–340. Biochimica et Biophysica Acta (BBA) - Bioenergetics 1797:1828–1837. Biochimica et Biophysica Acta 53:96–110. Progress in Lipid Research 49:46–60. Plant & Cell Physiology 29:587–595. Journal of Cellular Physiology 85:59–72. Journal of Lipid Research 17:16–20. Progress in Lipid Research 45:160–186. Biochimica et Biophysica Acta (BBA) - Biomembranes 255:720–733. Chemistry and Physics of Lipids 3:413–417. The Journal of Cell Biology 71:383–394. Journal of Cell Science 93:565–570. The Journal of Cell Biology 77:887–901. Journal of Lipid Research 22:1126–1130. European Journal of Cell Biology 48:19–26. Biochimica et Biophysica Acta (BBA) - Molecular and Cell Biology of Lipids 1841:215–226. Journal of General Microbiology 136:1271–1277. Biochimica et Biophysica Acta (BBA) - Biomembranes 1808:2761–2771. Oxford, UK: Oxford Univ. Press. New York, NY: W. W. Norton & Co., Inc.
Journal of Microbiological Methods 62:167–179. Canadian Journal of Botany 54:2478–2483. The Journal of Cell Biology 102:289–297. Biochimica et Biophysica Acta (BBA) - Bioenergetics 1857:198–213. Cell and Tissue Research 204:297–303. New York, NY: Garland Science, Taylor & Francis Group. Antimicrobial Agents and Chemotherapy 57:1082–1085. The Journal of Cell Biology 84:340–354. Proceedings of the Japan Academy, Series B 87:450–462. Journal of Structural Biology 156:334–341. Journal of Electron Microscopy 24:247–252. Journal of Cell Science 61:437–451. Biochimica et Biophysica Acta (BBA) - Molecular Cell Research 1803:748–766. The Journal of Biological Chemistry 268:12427–12433. Journal of General Microbiology 83:31–49. Biochimica et Biophysica Acta (BBA) - Bioenergetics 808:46–51. Journal of Structural Biology 156:342–354. Omics : A Journal of Integrative Biology 14:665–677. Biochimica et Biophysica Acta (BBA) - Bioenergetics 976:150–160. The Journal of Cell Biology 52:598–614. Canadian Journal of Microbiology 43:70–77. European Journal of Biochemistry 121:5–13. Journal of Cell Science 73:207–220. Journal of General Microbiology 39:355–366. Annual Review of Microbiology 38:459–513. Biochimica et Biophysica Acta (BBA) - Biomembranes 688:495–504. International Journal of Plant Sciences 161:615–630. Journal of Lipid Research 21:681–686. The Journal of Cell Biology 42:68–91. Biochimica et Biophysica Acta (BBA) - Molecular and Cell Biology of Lipids 1791:166–172. Theoretical and Applied Genetics 81:21–26. Journal of Experimental Medicine 124:533–542. Journal of Experimental Medicine 124:521–532. Thank you for submitting your article "Membranes, Energetics, and Evolution Across the Prokaryote-Eukaryote Divide" for consideration by eLife. Your article has been reviewed by two peer reviewers, and the evaluation has been overseen by Paul Falkowski as the Reviewing Editor and Patricia Wittkopp as the Senior Editor. The following individual involved in review of your submission has agreed to reveal his identity: Ron Milo (Reviewer #2). Summary: Both reviewers identified many strengths of this work, but also have identified additional elements to consider. I hope you find their detailed and constructive reviews helpful. We anticipate that this work will be an important contribution to the field that will spark additional discussion and debate. Essential revisions: Both reviewers have provided detailed reviews of this manuscript, and we believe that considering all of their comments will be beneficial in this case. These comments are provided in their entirety below. The most essential comment from the reviewers that must be addressed is: The "possibility that protein packing density in the membranes under consideration is a fundamental limitation needs to be taken into account." This is an interesting analysis of the relative bioenergetic characteristics in the growth of prokaryotic and eukaryotic cells. The article addresses the basic conjecture, that the evolution of the eukaryotic type, specifically the development of mitochondrial systems, endowed the eukaryotes with energetic advantages over the prokaryotic cellular organization. The authors are challenging this often-made, yet largely unsubstantiated, assumption that the presence of mitochondria in eukaryotes confers a large bioenergetic advantage owing to a corresponding increase in internal membrane surface area due to the presence of the mitochondrial inner membrane. To address this question, the authors perform an analysis based upon previous scaling relationships they have developed between quantities such as the volume of a cell and the rates of ATP consumption and combined these with a new analysis that includes protein and lipid abundances combined with estimations, from the literature, of their costs as expressed in terms of ATP equivalents. The authors note that the energetics of the cell can be divided into maintenance costs and the costs of duplicating the parental cell and their analysis goes on from there. Basically, they are concluding that if there ever was an energetic advantage (e.g. on a cell volume basis), then it no longer exists and that the eukaryotic cell type does not confer energetic advantages. Overall, I think the article is sound, albeit, it is difficult for this reviewer to critically assess the validity of their calculations, which on the surface seems sound. On the other hand, the article is written in a with the tenor of a polemic and is a bit rambling. Consequently, I believe it needs to be considerably shortened (25%). 1) Subsection “The energetic costs of building and maintaining a cell”, second paragraph: authors should cite Daniel Atkinson on the biosynthetic costs. 2)Subsection “The energetic costs of building and maintaining a cell”, last paragraph: A relatively simple scaling relationship for bacterial growth may apply for certain species, but it needs to be pointed out that at either end of the range in size there are slowdowns in growth rate, with certain larger bacteria, for example, having more protracted cell division times. 3) The possibility that protein packing density in the membranes under consideration is a fundamental limitation needs to be taken into account. My recollection is that many membrane systems are at least 50% protein by weight. It may be true that the bioenergetic machinery responsible for ATP production only occupies several percent of the total area, but this may be the upper limit for the bioenergetic system reflecting and optimal allocation of different protein functions, such as transporters, also necessary for metabolism. Presumably, the other mitochondrial components especially are present in an optimal stoichiometric ratio with respect to the ATP synthase and may indeed occupy much more of the membrane area. For example, if the ATP synthase has an intrinsically higher enzymatic turnover frequency than the enzymes powering the generation of proton motive force, then it's amount can be comparatively small on a stoichiometric basis and the other membrane complexes may occupy a large fraction of the membrane surface. The authors revisit the hypothesis that the mitochondria were essential for the development of eukaryotic complexity for energetic reasons. The authors thoroughly analyze the ATP and other investments as performed by current eukaryotic cells and compare them to prokaryotes. They use empirical scaling laws to see if the observed changes are more than one would expect from simple scaling with cell volume. They find no strong evidence for a significant energetic benefit from mitochondria which leads them to cast doubt on high profile earlier reports. I find the study scientifically sound and interesting. I have suggestions for improvement in terms of clarity and accuracy as given below. Main text, third paragraph: "This implies that the mitochondrion-host cell consortium that became the primordial eukaryote did not precipitate a bioenergetics revolution." In order to say it did not cause a bioenergetics revolution I need to have a definition of what is the definition such a revolution in as rigorous terms as possible. Either by the authors or by them repeating in detail a definition from previous authors. Throughout the paper the scaling laws have no uncertainty ranges on their parameter values. This makes it hard to understand how predictive they are and should be corrected. Subsection “The energetic costs of building and maintaining a cell”, fourth paragraph: "that a shift of bioenergetics from the cell membrane in prokaryotes to the mitochondria of eukaryotes conferred no directly favorable energetic effects. In fact, the effect appears to be negative." One could claim that because prokaryotic ATP production is associated with the cell membrane and it scales like the surface area an exponent of 1 with cell volume is not what one would expect (but rather 2/3) and the evidence supporting an approx ~1 exponent suggests there is some favorable energetic effect. I am not saying this is proof of such an effect but I think this point should be acknowledged/discussed. Subsection “Energy production and the mitochondrion”, last sentence: "and that the corresponding hypothetical packing density for eukaryotes would be 30% (if in the cell membrane)." The authors do not seem to reflect more on this value they derive but it seems like a very high value to me. Given that packing of equally sized circles on a sphere cannot achieve more than I think about 60% usage of the sphere area this is not far from the maximal possible and this is before considering all the other protein machines needed in the membrane real estate or the requirements for lipids. Subsection “The biosynthetic cost of lipids”: "and Escherichia coli (… 0.98 μm3, respectively)"
The volume of an E. coli cell can easily change by a factor of 5 depending on growth rate so giving the volume as 0.98 μm3 without stating anything about growth conditions is odd. Better state as ~1 μm3 or the like. Discussion, fifth paragraph: "because the end state is slightly deleterious owing to the additional investment required to carry out individual tasks (Lynch et al. 2001)." I found it hard to follow the logic here and I think other readers might have this problem. It is worth explaining in a bit more detail what is meant. Discussion, last paragraph: "It is plausible, that phagocytosis was a late-comer in this series of events, made possible only after the movement of membrane bioenergetics to the mitochondrion, which would have eliminated the disruptive effects of surface membrane ingestion on the ETC and ATP synthase." I did not understand the connection here. Please clarify. […] 1) Subsection “The energetic costs of building and maintaining a cell”, second paragraph: authors should cite Daniel Atkinson on the biosynthetic costs. Thank you for pointing this out; done. Fully admit to not having read this before, and it is remarkable how similar his results are to those of Akashi and Gojobori. Although he did not deal with lipids to any great extent, the little he did seems to be compatible with our calculations, so that is gratifying as well. Our point is already that there is a slowdown in the growth rate of bacterial cells at the low end of the size range. We are less clear as to what species the reviewer is referring to at the large end, as we attempted to perform as thorough and as unbiased a survey as possible; we have emphasized that there if a broad range around the general pattern. As noted below, in response to the second review, we have acknowledged the uncertainties in this area, but also note that protein packing issues will also apply to internal mitochondrial membranes (and perhaps even more so, owing to the need for proteins involved in the maintenance membrane folding). Thus, because there is not a dramatic increase in mitochondrial membrane area relative to that of the cell surface, the packing uncertainty does not seem to weaken our general conclusion that eukaryotes have not experienced a major increase in bioenergetics capacity relative to prokaryotes. Moreover, our goal throughout the paper has been to bring as many additional and independent lines of evidence to bear on this conclusion as possible – the smooth scaling of bioenergetics growth and maintenance requirements across the prokaryotic-eukaryotic divide, as well as the scaling of numbers of ATP synthase complexes and ribosomes, all support our general conclusion; and the substantial additional costs of building internal membranes in eukaryotic cells does as well. […] The authors revisit the hypothesis that the mitochondria were essential for the development of eukaryotic complexity for energetic reasons. The authors thoroughly analyze the ATP and other investments as performed by current eukaryotic cells and compare them to prokaryotes. They use empirical scaling laws to see if the observed changes are more than one would expect from simple scaling with cell volume. They find no strong evidence for a significant energetic benefit from mitochondria which leads them to cast doubt on high profile earlier reports. These were given in our prior publication, and are now repeated here. This is a good point that we had not made clear enough, so we now have added a sentence to this paragraph to make the SA:V expectation explicit. These are good points, and we now make a statement just before “the biosynthetic cost…” section to this effect. We do not think that these uncertainties upset our general conclusions, as the more general and compelling evidence derives from the absolute surface areas of the cell vs. mitochondrial membranes, both of which will be subject to the same packing problems (and as noted, perhaps more in mitochondria). In general, we have reduced the numbers of digits used throughout, with no resultant changes in the conclusions. This has been reworded in a way that is hopefully now clearer. We have tried to word this in a clearer way – the basic issue is that a cell would have a difficult time maintaining cell-membrane bioenergetics if the membrane and its resident ATP synthases was constantly being ingested. Support was provided by the Multidisciplinary University Research Initiative awards W911NF-09-1-0444 and W911NF-14-1-0411 from the US Army Research Office, National Institutes of Health award R01-GM036827, and National Science Foundation award MCB-1050161. This material is also based upon work supported by the National Science Foundation grant CNS-0521433. We are grateful to J Dacks, D Devos, J McKinlay, J Murray, and R Phillips for helpful comments. © 2017, Lynch et al.